As migrants and refugees continue to rush into Europe, European Union (EU) members held an emergency summit in Brussels. They hope to agree on how to deal with this large movement of refugees and migrants into Europe. The refugees are coming from countries hurt by war and poverty in the Middle East and Africa. 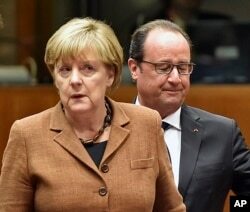 News reports say the EU members pledged to better control European borders from mass migration. British Prime Minister David Cameron called on the EU to deport migrants moving for economic reasons, like better jobs or health care. Refugees, on the other hand, are fleeing for their lives. Refugees cannot safely return home. Economic migrants can. Mr. Cameron met with French President Francois Holland late Tuesday. Mr. Cameron’s office says the two “agreed that EU countries should do more to return migrants who don’t have a genuine claim for asylum” back to their home countries. The ministers adopted a quota plan Tuesday where each EU country would take refugees and migrants. The plan would distribute 120,000 refugees and migrants among the 28 EU nation states. 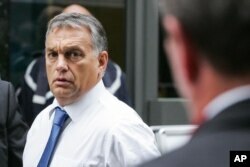 Hungary, the Czech Republic, Slovakia and Romania all strongly oppose the resettlement plan. The number of refugees could grow into the millions, not thousands, warned the European Union President Donald Tusk. Also at the meeting, the European interior ministers offered new aid to Turkey and other countries that are hosting refugees. Meanwhile, migrants continue to move through European countries toward a preferred final destination. For many, that is Germany or Austria. But for Adnan Bazaa, that country is Sweden. He had made a month-long trip from Syria. This week he arrived in Sweden, hoping that a residence permit, money to live on, housing, and a job, would be waiting for him. Mr. Bazaa had heard from friends and family that the Nordic countries traditionally provide food, housing and employment to all. But that system is being tested to its limits. More than 1,000 people have applied for asylum each day for the past weeks in Sweden. “It’s an escalating trend,” Mikael Ribbenvik told VOA. He is the operations manager for Sweden’s migration headquarters. Some migrants have hoped to resettle in large urban areas. Mr. Ribbenvik says some migrants and refugees refuse to get off buses when the government wants to send them to rural parts of Sweden. At the train station in Stockholm, Red Cross volunteers hand out food and provide first aid to migrants. One volunteer says most of the people coming through the station Monday decided to move to the neighboring country of Finland. They hear it is a shorter wait in Finland to get asylum. Mr. Bazaa decided that is where he will go as well. Hungary’s prime minister says a fence being built along the border with Croatia will be finished this weekend. Since Hungary finished its fence with Serbia last week, thousands of migrants a day have been entering Hungary from Croatia. Now, that border will be restricted, as well. Nearly 240,000 migrants have passed through Hungary this year. 35,000 came across the Croatia border. That includes 4,500 just between midnight and 6 a.m. Wednesday. They are all trying to reach the Austrian border. Hungarian immigration officials said that since Friday, not one of them has asked for asylum in Hungary. Prime Minister Viktor Orban says the world should share the burden of housing refugees and migrants. He repeated the idea that EU countries can help Greece protect its borders. Mr. Orban says member states should volunteer troops to keep migrants from coming to Greek shores, and the European continent. In Austria, officials say about 5,000 refugees and migrants came to the main border crossing with Hungary by mid-afternoon Wednesday. That beats Tuesday’s total of 4,500 people. Croatia shut out all but one of its border crossings with Serbia last week. They want to block the migrant flow into their country. It had reached 44,000 people in a week. Serbia is busing migrants to Croatia’s border, rather than sending them to Hungary. Closing the border crossing has hit Serbia’s economy hard. Migrants wait after crossing a border from Croatia near Hungary. While Croatia did let trucks carrying food from Serbia cross the border Tuesday afternoon, Serbian officials say they want all cargo traffic resumed. Poland says it will accept 7,000 refugees from Syria and Eritrea. They will gradually receive them in groups of 150 people in 2016 and 2017. While most will come from Italy and Greece, some 900 will come from Middle East refugee camps. Anne Ball wrote this story with information from VOA reporters and wire services. Kathleen Struck was the editor.